Sculpture in Stone (MFA), no. 108. The woman turns her head slightly to her left and gazes outwards. Her wavy hair, parted in the center and gathered in a bun in back, is bound by a broad fillet (ribbon). The hair below the fillet is carefully delineated and covers the top of her ears, but the hair above the fillet is roughly modeled. Her long oval face with small eyes and closed mouth ends in a prominent chin. Traces of a garment are visible along the edges of her bust and remnants of a cloak or himation are visible on the left shoulder and along the back. The head was worked separately for insertion into a draped statue. Condition: Nose broken away. The sides and back of the bust are roughly tooled. The bun of hair at the back of the head has been refastened. Two drill holes at the back of the fillet suggest that its ends were added separately. Yellow patina. Harvard Lab No. HI725: Isotope ratios - delta13C +4.28 / delta18O -3.37, Attribution - Paros 1, Justification - grayish, medium grained marble. 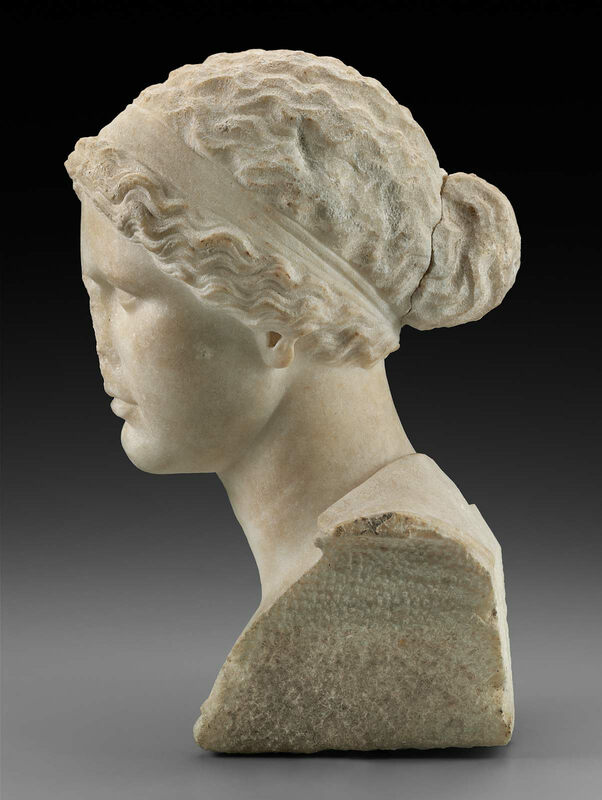 Although stiff, wavy hairstyles bound by a fillet were already popular in the fourth century B.C., the thin eyelids, subtle creases in the skin of the neck, andsmall, bow-shaped mouth suggest that this piece was carved later. 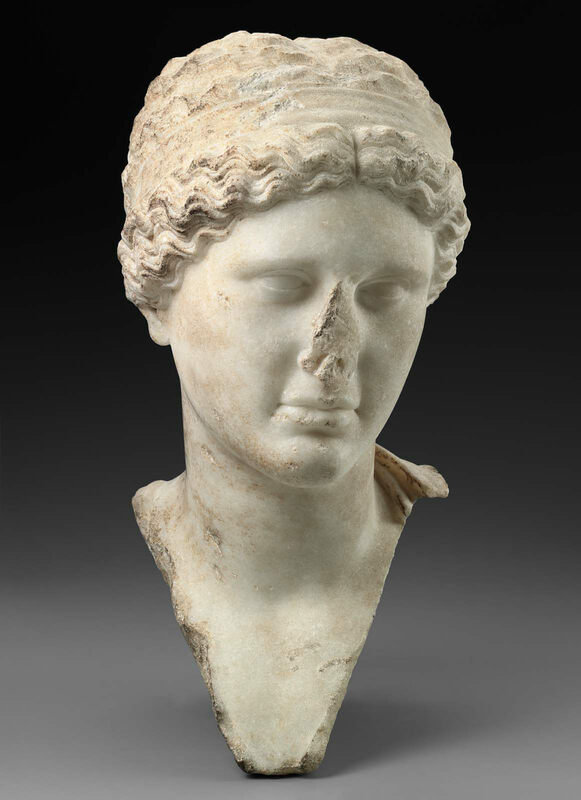 This head may have been a portrait of a specific woman, but it could just as easily have represented a muse, nymph, or other mythological female.